Time is money. It is an old fashioned cliché, but there is a reason that sayings become so popular in the first place. It’s because they are true! Every minute you waste being unproductive, performing tasks inefficiently, or handling jobs that are best delegated to someone else is costing your business money. Productivity comes in many forms. From digitising and automating processes to make them more streamlined, to setting achievable goals and learning how to focus effectively. Every business owner feels that there isn’t enough time in the day to get to everything they need or want to do. But, if you were to run a magnifying glass over your procedures, you would be surprised at just how much time you waste. That’s great news for your business though. I know it doesn’t sound like it immediately. But, identifying those problem areas and finding ways to be more productive can free up you and your team to focus on growing the business! Learn the best ways to stop wasting time and boost productivity from our tips below. Multitasking is so yesterday. People used to rave about their ability to multitask. However, it is now all about mono-tasking. Multitasking is essentially rapidly switching from one task to another. Sometimes partway through. This constant change in focus reduces your productivity and slows down your ability to manage tasks quickly. Mono-tasking is putting all your attention on a single task for a set period and is much more effective. It means focusing on one task until it is done. In order for mono-tasking to be efficient, you need to prioritise your tasks and your time. There is no point starting the work day by writing out your shipping list if there is an urgent client deadline looming, So it is best to focus on completing the most pressing tasks first. In line with the concept of mono-tasking, batching similar tasks into groups and working on them consecutively lets your brain settle into a rhythm. Every time you switch from one type of job to another, your mind has to refocus and adjust. Instead of checking emails intermittently throughout the day, set a chunk of time aside to read and reply to emails twice a day. Do your social media checking and updates in one block, create your content for the week at one time, then take a break and move onto your marketing, and so on. Make a list of those jobs you must do daily, weekly, monthly and annually. Often, these kinds of repetitive chores can be automated, digitised, or outsourced. Once you figure out how much time you spend completing the same thing over and over, do some research to see if there is an app or software available – you will be surprised at what is out there! Nowadays, you can catalogue your list with task management apps like Asana or Trello. They completely level up your lists. Or if you prefer to keep it simple with an old fashioned pen and paper, that’s fine too. However you do it, learn to love the process. Write down what you need to do, prioritise it, break it down into bite size pieces, delegate it, and get it done. Procrastination is the enemy of productivity, but we all do it. When you make your list for the day, put the hardest, most boring, most annoying job at the top. If you leave it until last, it can drag you down all day. Getting it out of the way while you are fresh and motivated gives you a lift and helps you power through the rest of your tasks. Ever heard of eating the frog? Well, that’s exactly what this. Get that yucky job out of the way first to make the day go smoother! Everyone has different work styles and different productivity cycles. Some people find they experience that natural flow and motivation that makes them super productive at 6 am, while others might peak at 1 pm. Figure out when that magic window is for you, and schedule your most difficult jobs for that period. You may find you get more done in that stretch of time than you do the entire rest of the workday! Don’t be afraid to mix things up and introduce some modern technology to your business! The best and brightest in the world have come up with some fantastic time-saving solutions which can work wonders for your company. Innovations such as Asana and Trello work as file sharing, project management, communication hubs – enabling you to strengthen your teamwork. Poor communication wastes time, so utilise programs like Asana, Trello, Slack, Google Docs and more. Better yet, integrate all of your systems to streamline your processes even further. You may think you are saving money by doing everything yourself. But in reality, you are probably holding your business back. Calculate how much your time is worth. Then look at whether it is financially prudent to spend your time doing the bookkeeping, and general admin work when your talents could be put to more profitable use elsewhere? Hiring a virtual assistant, bookkeeper, accountant, social media manager – whatever you need – is an investment in your company and creates that precious extra time you are looking for. It might seem counterproductive to take a break when you are trying to put out more results. But it really works. Pro athletes know that the body can only be pushed so far before it ceases to work optimally. They understand how to look after themselves and take breaks to recover. Why do we treat our brain as if it can chug on indefinitely? Pushing yourself too hard at work is a recipe for disaster. It makes you less focused, less productive, and more likely to burnout. Make sure you take regular mini-breaks throughout the day. Have lunch breaks away from your desk, and disconnect from the office at the end of the day and on weekends. Your mind and productivity will thank you for it! So are you ready to claim back hours in your week? Outsourcing the most repetitive and time-consuming tasks in your business can allow you to focus on the things that you do best – making the money! 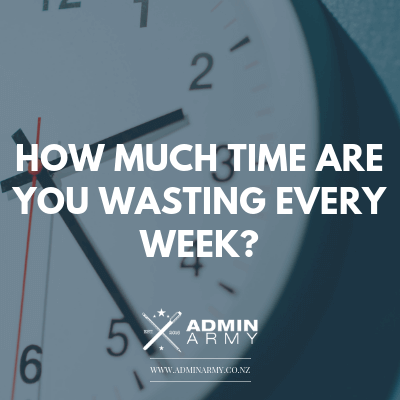 Get in touch with us here at Admin Army to see how we can stop you wasting time and help you to up your productivity.